Canadian tangler Cyndi Knapp has over a dozen cool tangles on the site and Azteka is her latest contribution. “Another mid-night pattern idea. And so as not to forget it by morning, I found myself air tangling in the dark to embed it in my mind. The name Azteka was inspired by both the design of the pattern and the finished outcome of the tile. It’s a very simple ribbon pattern combining S-curve and straight line strokes. Part of Azteka‘s composition is the triangle fret and according to Clarence P. Hornung in his Handbook of Designs and Devices, it “derives from Japanese heraldry” (Plate 182, figure 1637; Plate 183, Figure 1639). The fret, or meander, is a plane, rectangular motif taken from early Greek ornament. It is also, in some instances, known as the key pattern … fret patterns are the angular or rectangular counterparts of the spiral. Page 215, “The Fret”. For my example of Azteka I used the “stack side-by-side” option and varied the scale of the middle row just for fun. The Zentangle® tangle enhancer rounding and/or thickening the strokes adds yet another dimension to this lovely geometric tangle. 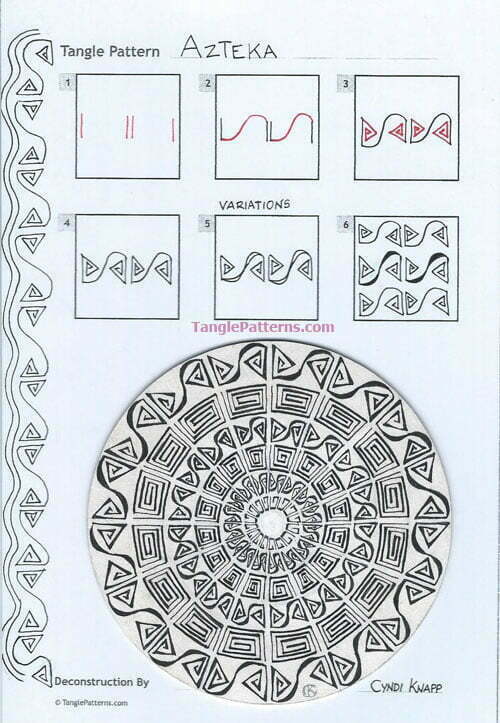 Cyndi illustrates the step-by-step instructions for drawing Azteka below where she features it in a lovely Zendala together with the “fragment” of the Zentangle-originals Ambler/Emingle as well as demonstrating it as a border or ribbon-style tangle along the edge of the page. This is very cool !! What a perfect name for a very unique and theme based tangle ! Thanks Cyndi really like this one!!! This is a lovely border, thanks for sharing! Beautiful combo of wavy and straight. I really like the “wheel” and border tangle samples. Very reminiscence of some of the Native American pottery patterns too. Will be a fun play. Thanks for sharing. Like this one a lot and think it will be very useful. I really like the mandala shown with the steps as well. Thanks! Thank you for all your tangles, Cyndi … and for reminding me that I’m not alone air-tangling! I air-tangle, tangle with my index on my leg when I’m nervous, and mind-tangle when my hands are busy. My air-tangling story — Some time ago, I had some outpatient surgery done. Let’s just say it was invasive. Due to certain drug allergies, I had it done without anesthesia while I was awake. During the procedure, I first air-tangled a light switch, then a fire sprinkler head. During that time, the doctor said to me, “I don’t know what you’re doing but keep doing it.” When the procedure was over, I heard one nurse say to another, “Her blood pressure didn’t even change.” So to Cyndi and Sharyn and all of the other air-tanglers out there, keep it up. Linda Dochter, that is a truly amazing story. Thank you so much for sharing it. I’m sure you will be able to use your air-tangling skill many times in your life and you have convinced me I will have to try it too. It seems like a perfect meditation practice. Linda shares her full story on TanglePatterns, “STORIES: Zentangle helped CZT get through pre-op procedure without anesthesia“.